We now have new gear to better serve our existng and potential clients and to be more competitve than the competition by raising the bar with BARTECH! Almost everyone that has been in the film and video industry for awhile knows the name: BARTECH. It is a industry standard for wireless follow focus and iris controller for cinema lenses. In the best interest to our clients, we do not rent the Bartech kit as a rental to the general public, just like our jib... we come as a complete kit/package for our client's needs. Therefore we maintain availabilty, reliabilty and exclusivity to our clients. Thanks for understanding. Power must be provided by camera owner, since it requires two D-Taps for powering the BARTECH's two seperate recievers for focus and iris motors. (1) Heden motor: M21VE-L﻿﻿, comes with wired digital reciever that mounts near camera, requires D-Tap for power: 12V min, 24V preferred. The M21VE-L is the ﻿bigger motor with larger torque curve that can drive the stiffest of cine lenses. (1) Heden motor: M26VE﻿, comes with wired digital reciever that mounts near camera, requires D-Tap for power: 12V min, 24V preferred. Smaller, lighter and compact it can drive most cine lenses. 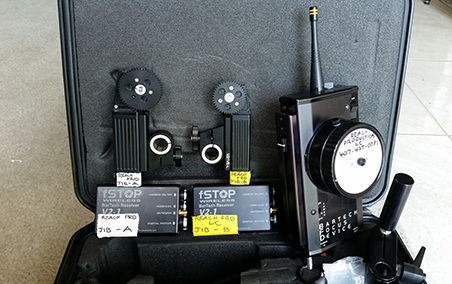 Also included: various sized antennas for both recievers and hand unit, marking pens, a custom Pelican case﻿, "dog bone" available for extra reach to a lens that may be situated a little too far for the motors to mesh with the respective gears for focus and iris. We also have Red Rock Micros': Lens gears to clamp onto non-cinema lenses such as a DSLR styled cameras. 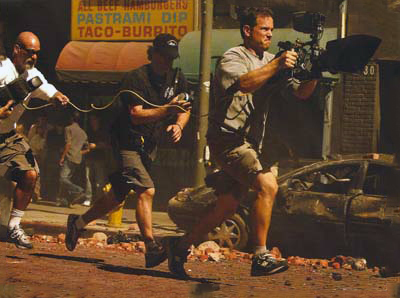 Used on major movies such as this photo of an older BARTECH in action for TRANSFORMERS! If it is good enough for Michael Bay... 'nuff said! We welcome your questions and queries. Please see our Contact Us page for complete contact information. Copyright 2011-2016 Reach_Productions. All rights reserved.